I have been doing commission work for... well, it seems all my professional life as a costumer! 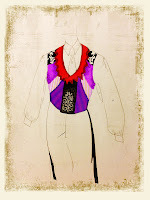 Most of my independent costume design work is done with a contract for a stipend to design and produce the costumes. It was part of my job to figure out what was needed and make it happen. It's not much different than any commissioned art piece--I talk with the customer, find out what they need, and then make it happen. Over the last couple of years, I've been doing a lot more commission work for individuals that want a specific variation on one of the products they've seen in my shop, or they are looking for a specific item and they can't really find it for sale on the market. I've made 1980s ladies velour vests, wired lace ruffs, and vests for the groom in bridal parties. 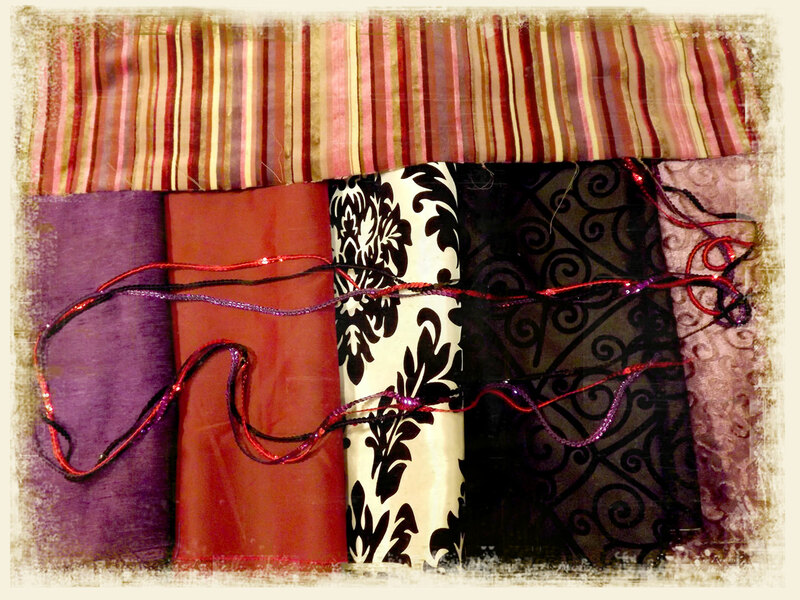 I've been hired by friends for my costume construction skills, and even made capes for drag queens! 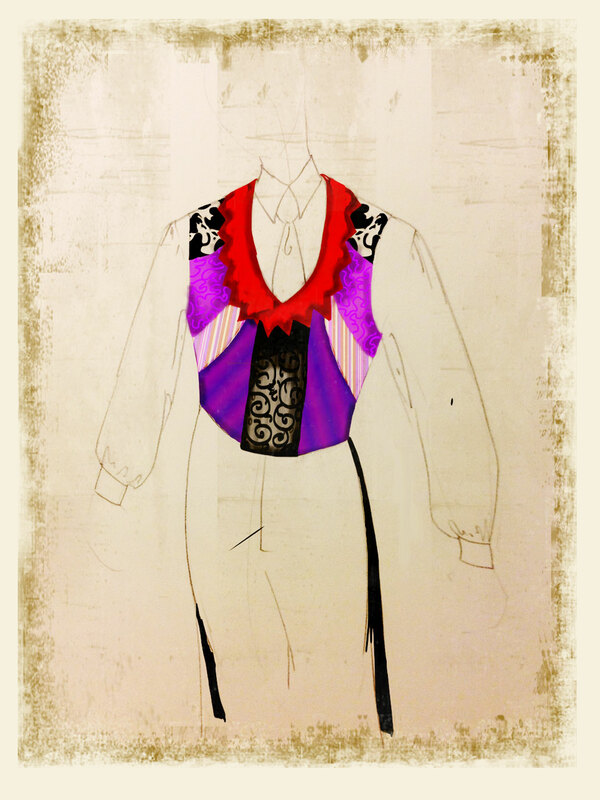 But my latest piece was made for a performer who completely fits my style: a juggler in a cabaret act. He wanted to know if I could make him a similar vest in different colors. I said I could, quoted him a price and made a listing on Etsy. When he purchased it, I went to work. 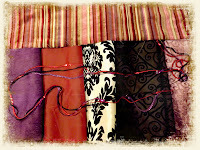 I gathered fabrics that I thought were indicative of what he was thinking, scanned in a photograph of them, and sent him the update. We had conversed about his situation and the style he desired over email previously, so I was pretty sure I was moving in the right direction. 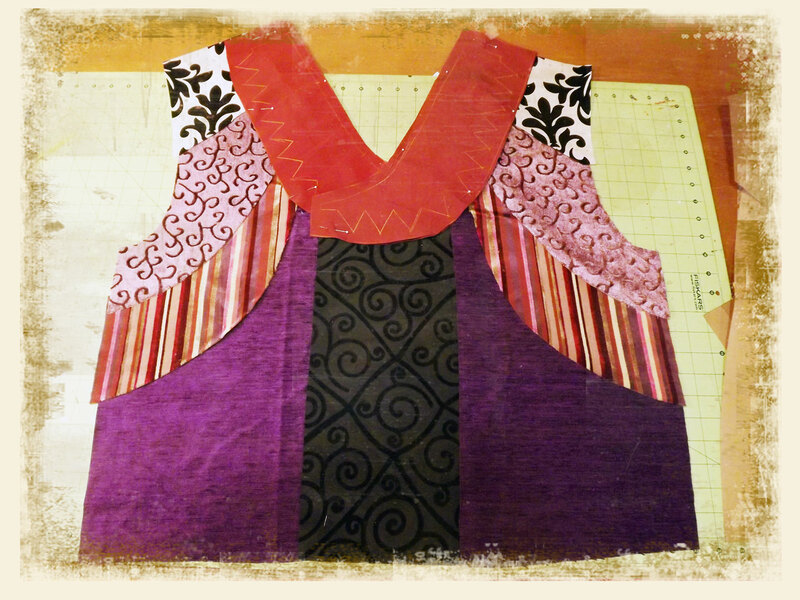 After some feedback, I gave him a rendering using the fabrics I'd swatched so he could visualize the vest more specifically with a bit more of a guide rather than words... With his okay, I started assembling the vest. And here's the finished product! 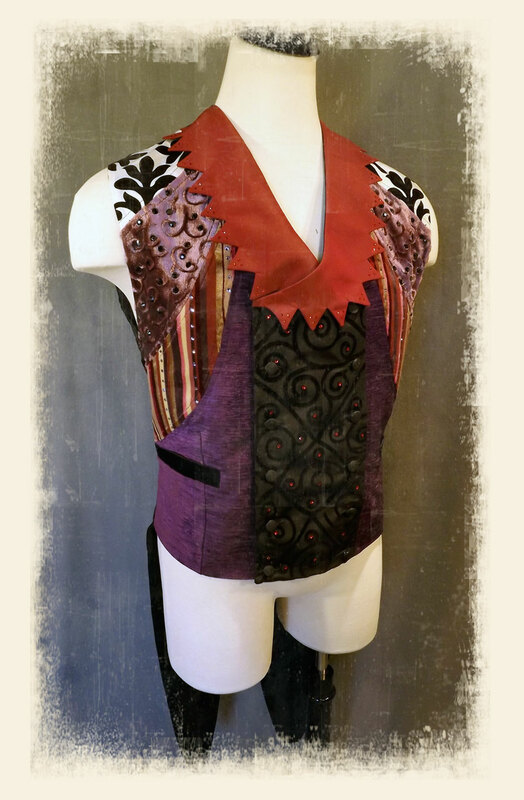 I had to modify the pattern I was already using for my Ringmaster vest to incorporate more fabric choices and make it a smaller size. I also used rhinestones to enhance the fabric motifs and decorate the collar. So it wasn't an exact duplicate of the Ringmaster vest by any means, and that took a bit of coordinating and adjusting, but in the end I think the piece is incredibly effective. I may end up doing more commission work in the future, but I have to really evaluate the price structure. 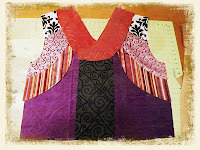 I'm learning that I have a tendency to underestimate the time investment in my projects... I guess I never really learned to get over my eyes being bigger than my stomach... Which could be dangerous in the future, so I have to be diligent. Do any of you do commission work? Do you use a specific form/format/method/system for engaging in commission work with clients? Do you have policies that facilitate the process for you? Do you use contracts or rely upon email agreements? Do you have set prices, or do they vary depending on parts of the artistic process? I'd really be curious to know. I have not found a formulaic "structure" for the process myself, but I don't ever make anything until they've paid me first. I spend a lot of time going back and forth in discussion prior to even starting, but I think that's better than finding out after-the-fact that what you've made isn't what the client wanted. Being a costumer, I find that the artistic side of the process isn't my problem--it's the business side! Go figure!! Haha!! I plan on taking a "catalog" of my commissioned works and other costuming items with me to the fairs and festivals so potential clients can peruse possibilities. Anything "outside the box" of my catalog would need to be hammered out, of course. But I think it might be a good tool to have on hand to facilitate future sales and work. We'll see if it's effective or not--I haven't done my first fair yet, so it's all theoretical at this point! Until nest time, Live Life With Relish! Corey, in my "early years", I did a few commissioned bags for customers who flattered me enough. But I deeply regretted doing it because it's so stressful for me. In the end, I think I invested far too much time in a bid to meet the customer's expectations. Nowadays I only accept fabric customisation for bags I've made before. I wonder what your customer looked like with the costume on?